24-volt wire to air conditioner chewed through now furnace wont turn. Shut the power off, splice the wire or just replace it. You can buy it on the right. After installing a new bathroom fan, can I wrap it in insulation for sound reduction? I do not think it's going to make a big difference, but you can give it a try. Air conditioner duct touch attic insulation. This is fine, but if you live in a very humid climate you shouldn't bury it in insulation. Attaching a 7 inch duct to a curve piece of metal. If this is an elbow it's not recommended, but if this is a connection to another pipe then you can get more info in Chapter #45 of my Ductwork Installation Guide book. Can a cold air return be shared between two rooms? Yes, if these rooms share the same level of privacy, for example, a bedroom and adjacent walk-in closet. Can a cold return vent be closed off and not be replaced elsewhere? No, more info on this page. Can electrical wiring through floor joists touch metal heating ductwork? Can furnace drain on to crawlspace? No, it should be connected to the drain pipe or to the sewage. Can gas water heater and gas furnace vents be tied together? Can I add another appliance to a condensate pump? Can I cut a hole in the ductwork to put an a/c vent in my garage? Can I dryer vent run through an unconditioned space? Yes, but make sure it's insulated. Can I have a gas furnace in my crawlspace? Can I have two bath exhaust fans on the same ductwork? Can I heat a room with my dryer vent? Well, if you are not sensitive to smell, then there are some devises that allow you to do just that. Can I install ductwork before I buy a furnace? If you know furnace size it wouldn't be a problem. Can I install my air handler on the end of my ductwork? No, if your ductwork size is reduced by transitions. Can I install the exhaust from a bathroom fan into the warm air duct of the house? No, but how did you come to such a bright idea anyways? Can I mount my exhaust fan under ductwork? Yes, but it shouldn't touch the duct. Can I put a dresser in front of the cold air return vent for my furnace? Yes, but make sure that there is at least 1" clearance. Can I put a grille in my return air duct in my basement? Yes, but if you have a gravity furnace or water heater or both it should be cut in 10' away. Can I put screws in cold air return under house? Can I replace a 7" duct from my ac plenum with an 8"? Can I run a duct between filter and fan? No. However if your system in the attic, then yes. Can I run a take-off off the top of the warm air plenum? Can I run my forced hot air system without vent covers? On the supply side yes, but on the return one I wouldn't recommend it. Can I run phone line through air return? Can I start my garage heater vent with elbows? Can I use regular duct to vent a furnace? No, it should be 26 gauges of so-called smoke pipes and B-vent pipes. Can I vent my furnace to the garage? Can one humidifier work on three floors with separate furnaces? Can you drive three cars at the same time? Can transition plenum be installed between furnace and coil? Can two heat vents be run off of one? Yes. And you can buy a Tee for that on the right. 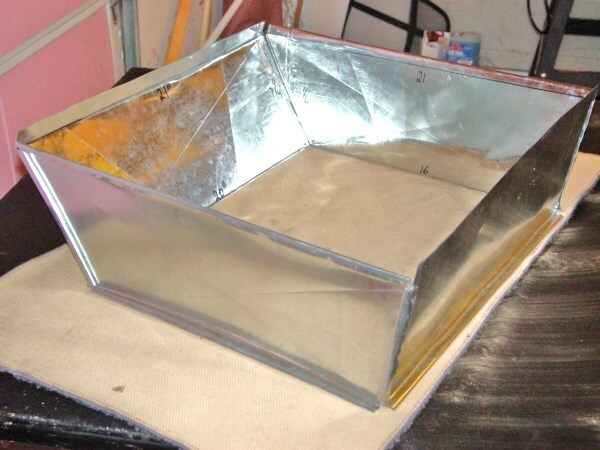 Can you attach sheet metal ductwork to wood? If this is ductwork for a cold air return, then yes. 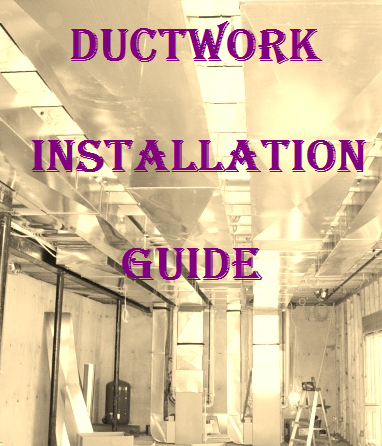 Can you hook up an exhaust fan without ductwork? 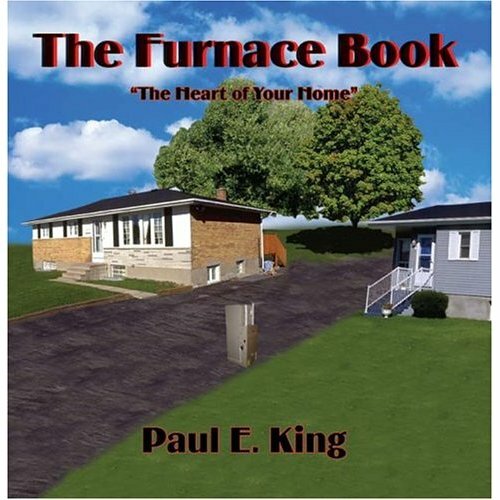 Can you place a forced air furnace in garage and run piping down into crawl space? Can you put a high efficiency furnace in a crawl space? Can you put an opening in the cold air return in the basement? Can you shorten a concentric PVC vent? If it's already glued together, then no, unless you can cut and reconnect the pipes inside your house. Can you use an existing 6 in. metal flue with a condensing furnace? No, it should be run in the PVC pipes. The existing B-vent pipe you may still need to vent your water heater. Ceiling filter clogged froze furnace lines fan not blowing hard. Just replace the filter. Buy it on this page. If this question is about a rigid aluminum flex, you can crimp it just as it would be a pipe. Distance between suspended ceiling and furnace pipes. It could be almost zero clearance - your suspended ceiling should not touch it, that's all. Do all cold air returns have to be connected to the main return? No, it is not necessary but it is desirable. Do I need a fresh air source when moving my furnace to the attic? If your question is about combustion air intake, in most cases no. Do I turn off humidifier when air conditioner turned on? Do water heater vents use regular ductwork? No, it should be made from 26 gauges sheet metal plus B-vent pipes. Does furnace ductwork need to be level? Yes.This way it looks better. Does having more elbows in a range hood fan duct impede draw? Does Jenn-air vent system need to be wrapped in insulation? If you running it through unconditioned space, then yes. Does using floor register filters interfere with a heat pump? Yes, it's adding restriction to the system. 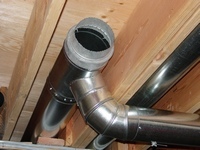 Dryer duct exhaust near the fresh air intake of a high-efficiency furnace, water heater or any hvac intake. Forgot to install joist hanger now what? Well, I cannot see from here, but I'm confident that you are going to find a solution. Electrostatic filters forced air furnace clicking noise. Most of my customers are getting rid of these things. Heat pump, do you also need bathroom fans? How can I duct my kitchen to the outside without piercing wall or roof? Would you sit on a toilet with your pants on? How come I cannot duct heated air to my garage? How do I finish a basement with low ductwork? You can try to re-run it around the basement's perimeter. How do I know if ductwork is run into attic? How do you determine how many and what size cold air intakes to use in a basement? Put one 14 x 6 air return in each room plus double cold air return in the great room. How does a damper inside a heating duct work? When its handle is parallel to a duct - it’s open; when perpendicular to a duct it’s closed. How does the reduction in heating air ducts works? It keeps static pressure in ductwork constant. How far should furnace vent be from the thermostat? Thermostat should be on a maximum distance from any supply register. How high should thermostat be off the floor? How many hvac registers can you put on one 6" pipe? How to determine if pushing more air than ducts designed for? In this case your ductwork would be much nosier. How to hook up England furnace to ductwork? Just like any other one. Get more info on this page. How to install a rectangular duct damper in existing ductwork? If there is a canvas, then disconnect and pull it out, drill two holes, enlarge them with a scratch awl, insert damper, put a handle on and secure it in the duct with the wing nuts. How to install duct wrap insulation and seal with tape and mastic? On this page you can find both. How to stop rust in galvanized drain pan? First you have to find where water is coming from, and secondly replace the pan. How to tap into insulated ductwork? Put a template on the duct and trace it with a utility knife, remove the insulation and trace it with a magic marker, cut a hole in the duct and install a take-off or a collar. Buy a take-off on the right. How would you add a second cold air return? This one is a complicated question, but you can purchase an answer on this page. Yes, this is a very good and reliable seam, but you can't put it together the way you would put together ducts with snap-lock seams. For this one you have to secure at list 3" black iron pipe to the bench, leave out a bit longer than your sheet metal pipe is. As I remember this size (24") pipes usually no longer than 30". Put the pipe on it, put pipe together and hammer it down with a hammer or for the best result use a mallet because a hammer may leave some dents. The technique described above we used for the smaller diameter pipes. For your pipes it could be done much easier: put a pipe together on the concrete floor and roll it till a seam is on the bottom. Hammer it down from the inside. I want to install a furnace and ductwork were do I start? Start from load calculation on this page. Is a little bit of condensation in a drip pan ok? Is it code to have a fresh air intake for an office building in Maryland? Is it ok to vent a bathroom fan into the basement? Is it okay to run a gas pipe along ceiling in a garage to house? Is it safe to have hvac vent in drop ceiling tile? Absolutely, if you install it the right way, as I recommend on my site. Lowest hvac unit for basement. Rheem is making pretty small furnaces only 34" tall. My central air went out a few weeks ago. My air & furnace are 23 years old. I have been told by 2 different companies my air would be to expensive to repair for it’s age. I want to sell my home in a few years so makes since to me to replace both. I have had estimates by 4 different companies. The costs have been pretty close with in 1.000. They have given me quotes on a varied of products, how can I know which is the way to go. I have proposals on Trane, Carrier, Payne, American Standard, and Rheem & Duncan. I have no desire to just pay for a name but I also want to pay for a good unit. Any wisdom on this you could give would be much appreciated. Is there a site I can go to or would you have an opinion on these brands. I read Rheem furnace is good but not their air? Ask your friends/neighbors on which contractors they like. Look for reviews online. Ignore positive reviews, and read the negative. Ignore any that seem to be from whiny people, and pick the contactor with the fewest series negative reviews/year. All those brands are OK. Goodman is on the cheaper end of things. Trane is on the more expensive end. American standard is owned by Trane and is generally cheaper. Generally the quality of the unit represents its price, but things get really expensive on the upper end. I'd recommend something right in the middle. My return grill is on the floor is that OK? No, this is old and stupid design put it on the wall. New gas water heater has high pitch noise and smells like gas. Instead of typing something like this in your search engine, run for your life and call a gas company out! One of my ''U'' shape duct vent make a metallic noise (must be a small screw or something from the construction). It's annoying and I don't want to finish the gypsum before I fix this. I was wondering if I can just drill a small hole through the duct vent in order to withdraw the metallic thing and then just put a tape to patch the hole. Drill it on the side where the surface is flat; stick a flexible magnet in to try to get the object. The make metal hole plugs to push into the hole. So go to the hardware store first and get a plug, then drill your hole that size, pop plug in when done and stick some duct tape over it to help keep it in place. Just hope that the foreign object is metal, if not you will be doing all of this for nothing. Pee trap on air intake. You do not need it! Just stop peeing in the air intake and save on a P-trap. Pictures materials for ducting installer. You can find 224 high quality pictures of materials on this page. Rain coming through furnace dangerous? Relationship between ducting size and heating capacity of forced hot air furnace. Larger furnace means larger ductwork. I put these four words on this page only because someone who typed them in his search engine visited only one page and spent zero seconds there! Should cold air return be open in the basement with air conditioning? In the summertime, you can keep it partially closed. Should I add return ductwork to each bedroom? Should I close the basement door in the summer air conditioning? Should my heaters fan be on when the air conditioner is on? Should you close air duct returns in basement in summer? Solar panel making ticking noise. Well, I'm not sure what inside the solar panel can make a ticking noise, but I'm pretty sure that you are able to figure it out if you would read on this page! The house my family purchased about 6 months ago lacks (or so we thought) any HVAC vents or returns in our finished basement. The other day, I removed a drop tile and poked my head up there to find that it DOES have vents already, they’re just not connected to the ceiling tiles. The horizontal, rectangular supply duct has the cutouts already made and the actual vent covers that would normally be attached to the ceiling tile are screwed directly into the duct and in the “closed” position. There’s probably 3-6” of a gap between the ceiling tiles to the horizontal supply duct. So, my question: What do I need to purchase in order to get that extension between the duct and the tile so I can transfer the vent cover to the tile after I cut a hole for it? You can get the answer on this page. Thermo-pan or sheet metal cold return. Yes, you can use a thermo pan instead of sheet metal, but it is much thicker. Ugly high efficiency furnace exhaust pipes. Yeah, I know there a lot of hacks around, but why don't you want to fix it yourself? This is very simple DIY project and I have Chapter #49 in my Ductwork Installation Guide book thoroughly describing this type of installation. 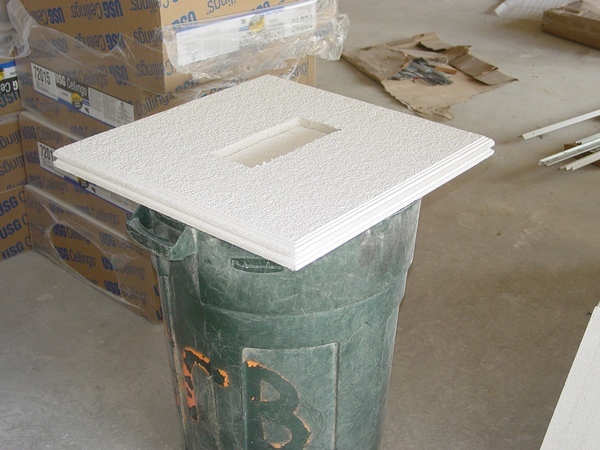 Using white packing foam to stop knocking new furnace ducts. If this is still new installation, call installers back! Otherwise, stop inventing a wheel go to this page and find a solution. Venting range hood without duct into space between joists. Wall return air vent grille, which way do slats go. If it's high on the wall, then up, if it’s low on the wall, then down. The main concept is - you shouldn't be able to see on the inside. 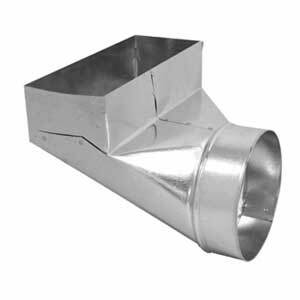 What are different types of ductwork fittings? Well, currently I have 224 pictures of materials needed for furnace/AC/ductwork installations, find them on this page. What causes 100's of dead bugs to be blown through air exchanger system of building? 100's dead bugs!?! Could be two causes: ends of days or a bad filter. What do heat pump condensation pumps do? It's pumping water to the drainage. What happens if you shut off cold air register? If only one, not much happens. What happens to when you reduce cfm in ductwork? Then you will get less of airflow. What keeps a hvac compressor from overheating? What keeps air from being pulled back into house from a microwave with duct to outside? You should have a flapper on outside and a back draft damper on the inside. Buy a wall cap with a flapper on the right. What kind of ductwork to use when venting a dryer? The best one are the galvanized pipes. When installing an HVAC system, does the builder or installer insulate the ductwork? Normally installer doing this, but sometimes they hire a professional insulator. Where does the 24 volts come from on the air conditioner? Why did builder only install two heating ducts in basement? Well, but how many do you think you need? Why do hvac installations put the heat vents under windows? If its 4 feet away, then it's done according to code, if it's closer call the installer back. Why do I hear a popping sound when it's windy above my ceiling fans? Because there is a back-draft damper, which makes such a noise. Why do they install ductwork? Well, would you pay them if they don't? Why do vents sing when heat or air on? Why does it sound like there is water in my furnace? Well, because if this is a high efficiency furnace there is water in your furnace, but you shouldn't hear it unless the condensate tubes, condensate trap or condensate lines are clogged.